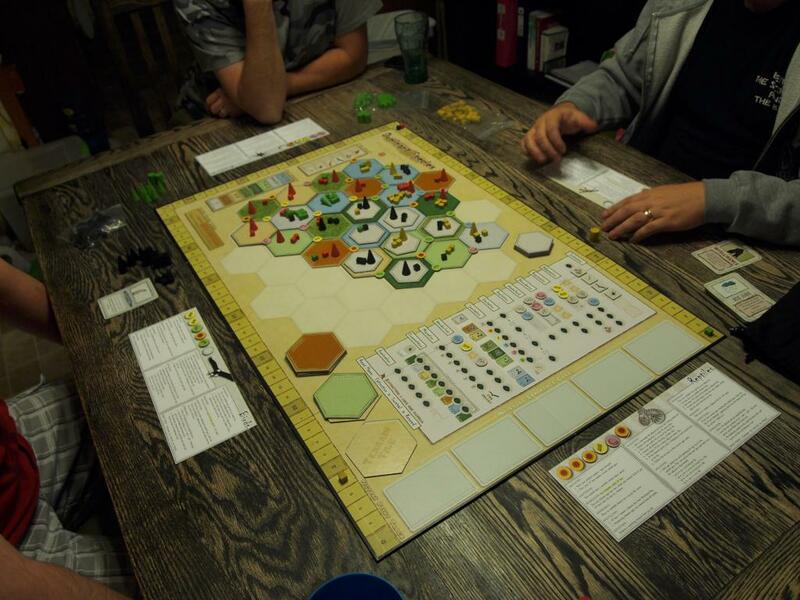 I taught Archipelago to Joe, Kevin, Louis, and Phil Saturday evening. There was a fair bit of confusion, and no one really had a defined strategy. Joe was being disruptive with the barbarian card, so that didn’t help anything. The surplus worker market was also getting pretty full from all of the exploration we were doing. We ended up losing after about four rounds. It was interesting. We all agreed that a learning game like this was needed, and that things should be smoother next time. Louis took off, so the rest of us broke out Railways of Europe. Phil quickly went into debt connecting to Moscow. I had the baron for fewest books, so I picked up a couple of hotels early to keep my expenses down. Joe grabbed the other hotel available, while Kevin started in the Berlin and Paris region. Joe was building in Italy and was keeping his debt low, forcing me to carefully consider every expense. I did get some good routes into my hotels, and managed to be the first to deliver four different goods. I also completed the Berlin to Rome line. We were all very close on scores, but Joe was my biggest concern with his low debt. I noticed late that the Paris to Constantinople was available, and quickly started that direction. One the last turn, a service bounty into Constantinople came up, but I didn’t have any goods to deliver. Joe won the bid and quickly built and delivered the bounty. I had other deliveries, though and wasn’t terribly concerned. The game finished, and I had completed my baron. 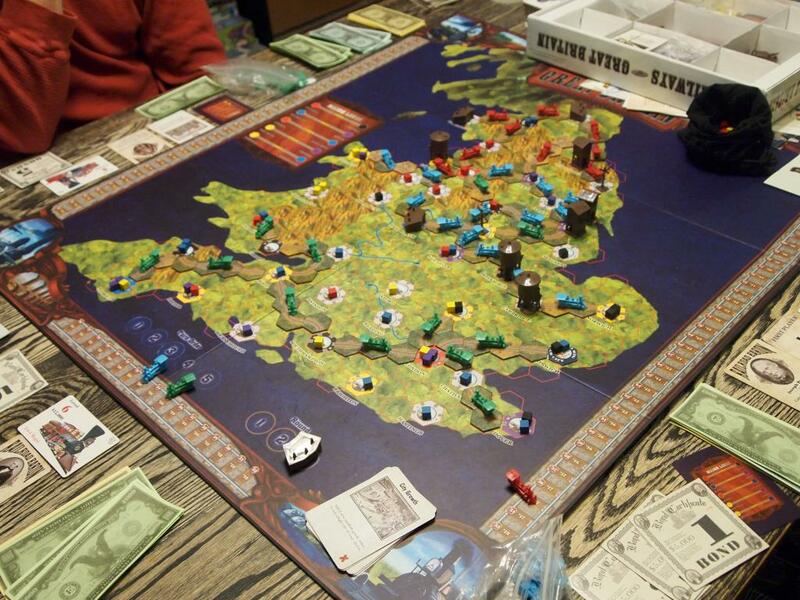 Joe did not have the most advanced train, and I managed to win by two. We finished the night with Eminent Domain. Joe was the only one going military and was making headway that way. Kevin was researching, and Phil was just colonizing everything. I had picked up a couple good production planets, and focused heavily production and trade. 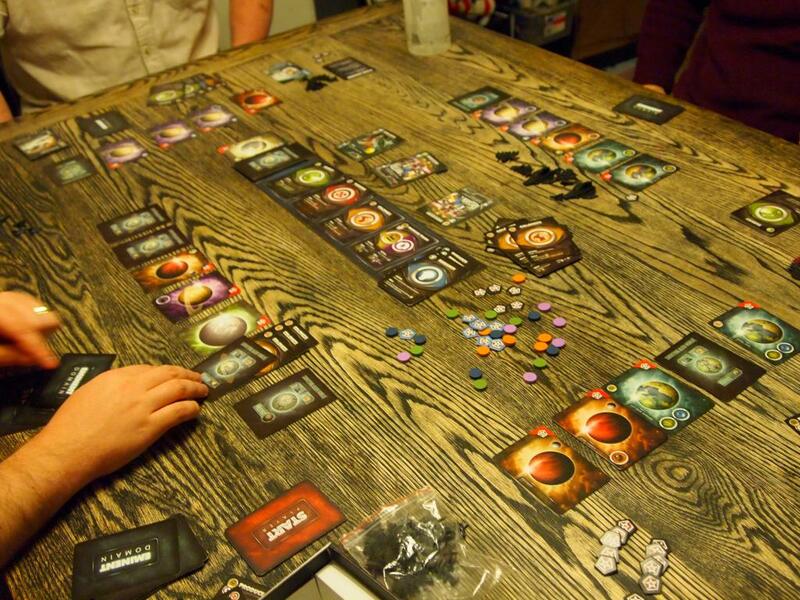 I managed to score 11 points from trade and another 11 for my planets, just barely beating Kevin and his 21 points. 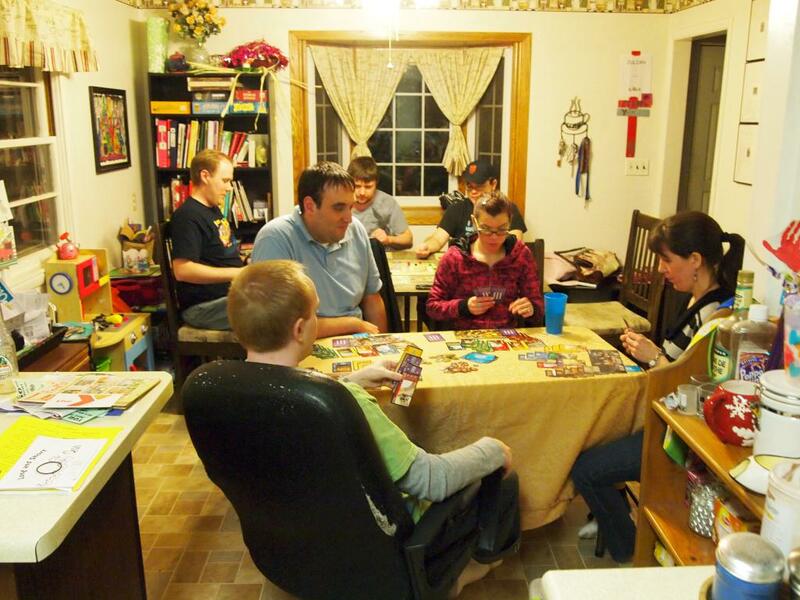 We had friends in town for my daughter’s birthday, so we ended up with multiple tables for games. 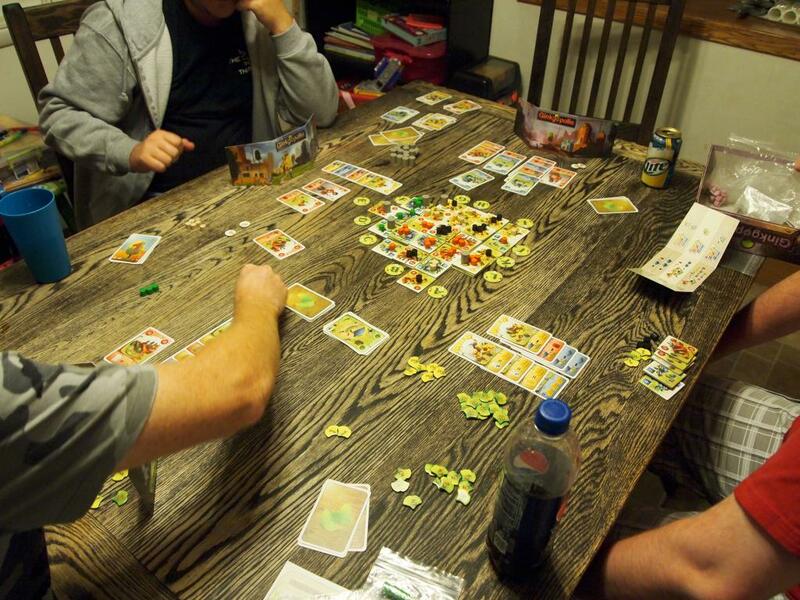 Joe, Gina, Dana and Laura played Agricola on one, while Louis, Kevin, Nick and I started with Glen More. Louis started off picking up whiskey, Nick was figuring things out and ended up with a butcher, and Kevin and I were working the Annual Fairs. Kevin missed out on the castle that provides bonuses for villages, and I managed to grab the Iona Abbey, giving me a bonus for each yellow tile. Nick ended up getting into the whiskey and taverns, but it wasn’t enough. Kevin and I were working the fairs as much as we could, but I ended up with just a bit more. We followed that up by learning Samarkand. It was a little rocky at first, but we got things figured out. The right side of the map was quickly engulfed in trade agreements between white, purple and black. I had managed to pick up four cards right next to each other on the map and was the only person with family members close to those goods. I was able to quickly claim them and then merged the various families in the area. I ended up scoring the full eight points for six of my seven cards, and had a bunch of points in agreements as well. Kevin came close, but I was able get the win. 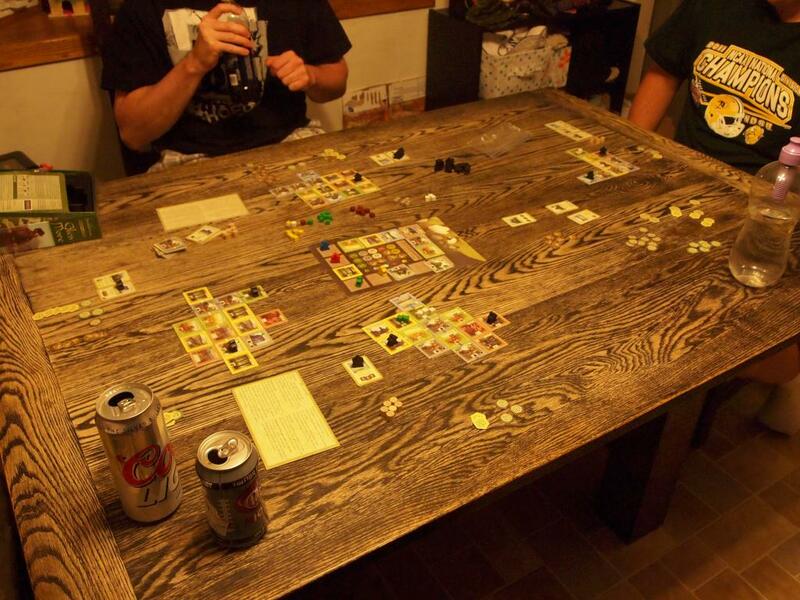 The other group had finished Agricola and things were winding down for some. 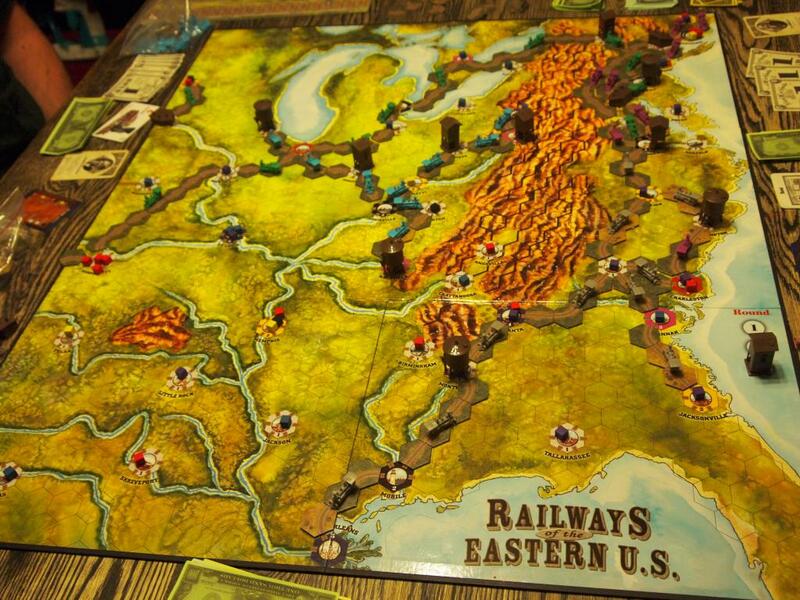 Louis, Joe, Kevin and I were up for more, so we finished the night with Railways of the World on the Eastern US map. There were four service bounties available easy, but only two of them were easily complete-able. There was also Hotel Atlanta, but without much for deliveries available to Atlanta it wasn’t very desirable. I ended up going last, and Louis and Kevin positioned themselves for the two bounties. Joe connected to New York trying for the “four different goods” bonus. I decided to go for the Atlanta to Richmond major line, and while my baron rewards fewest bonds, I took the bonds needed to complete the route. 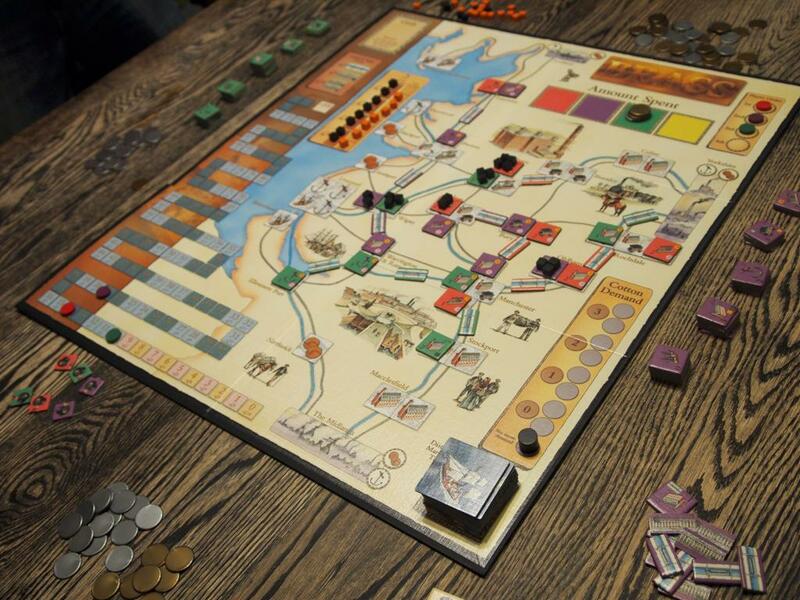 On the second turn, I was able to upgrade my train and scored the bonus for the first three-link delivery. That really set me up, and I didn’t need another bond all game. A couple turns later, the Service Bounty for Raleigh showed up, and I had the connections and completed it easily. I also built to Jacksonville and scored the service bounty that had been available from the beginning of the game. Upgrading to a level five train was all it took to finish out the game in the lead, as I was able to make four-five point deliveries throughout the area. Louis pulled close, but ran out of steam after delivering all of the five and six point deliveries in the Louisville area. Kevin managed to connect New York to Kansas City with the western link, but the debt was too much, and Joe just couldn’t get a lot going in the northeast. 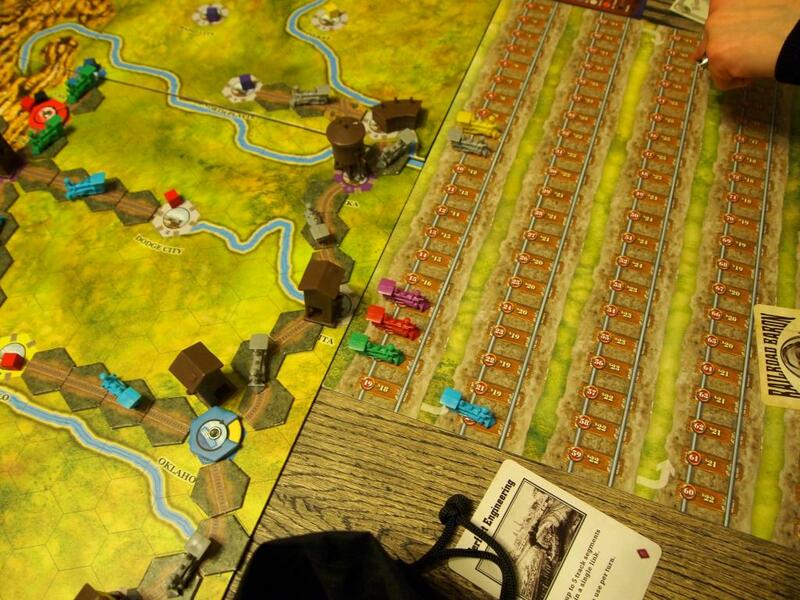 It was the highest scoring game of Railways we’ve had in quite a while, but it also highlighted a few of the reasons we tend to prefer the Western map. Like the easy major lines, and the higher values for the service bounties. It was still fun, though and definitely one of our favorite games. 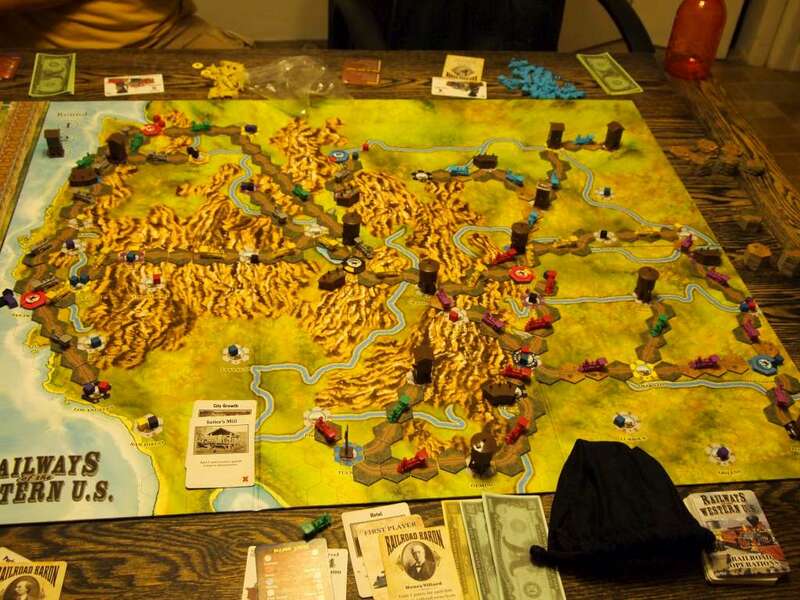 Louis, Joe and Kevin joined us Saturday for games and Railways of the Western US was the first to hit the table. My baron rewarded connections into Portland, so I was destined to play in that area. Luckily, there were a few good deliveries there, and then a connection from San Francisco to Sacramento was able to provide the third good for a quick three bonus points. Louis picked up the Hotel Denver early, but there was a distinct lack of good deliveries in that area for once. Kevin had a Service bounty to Tuscon, while Gina had a service bounty to Bismarck. 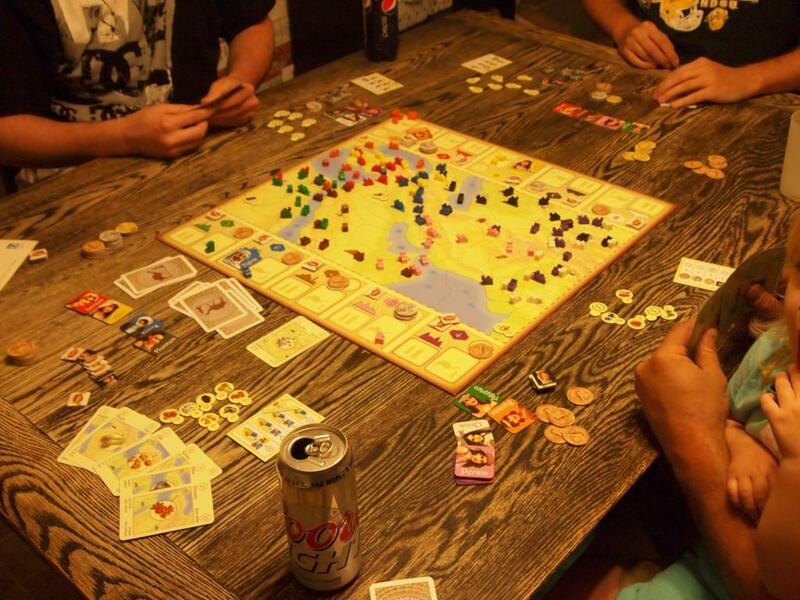 Joe was left to play in the lower mid-west, capitalizing on a service bounty to Fort Worth a few turns later. Surprisingly, I was left alone on the west coast, and was able to connect Los Angeles to Tacoma relatively easily. I was also able to upgrade my train as far as level 6, and was consistently making deliveries up and down the coast. Gina also managed to get a well upgraded train and was delivering all over the upper midwest from Fargo to Denver. A last turn service bounty to Reno boosted my score a little, but even without it, my lack of debt and strong showing was enough to edge out Gina for first place. She just missed out on having the most money at the end, putting her in second. We followed that up with a quick game of Ginkopolis. I was pushing hard on the construction, but I didn’t have a good source of tiles, so I was forced to exploit every now and then. Joe and Kevin were urbanizing like crazy, and we ended up with quite the sprawling metropolis. In final scoring, Joe and I each had a bunch of bonus points, while Joe also had a share in a bunch of the districts. I only controlled one, but it was a big one. We ended up tying for final points, sharing the victory. 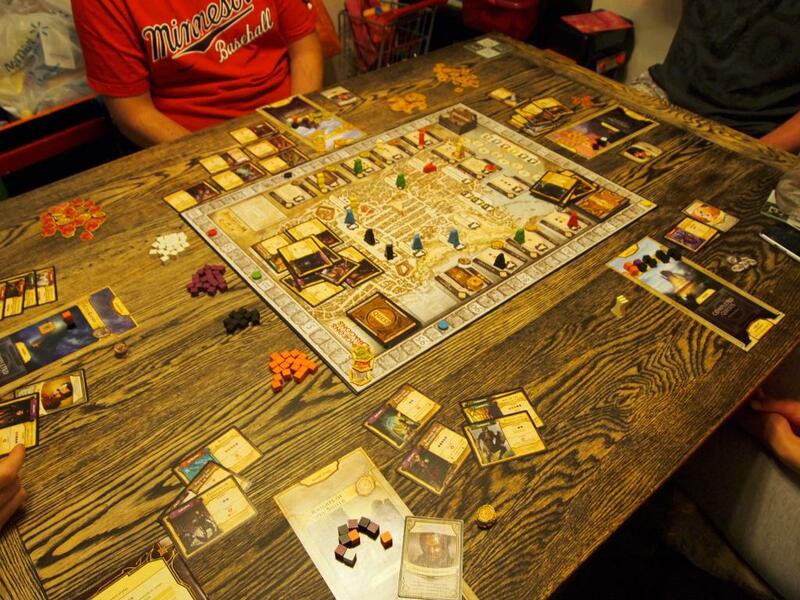 The last game of the night was Lords of Waterdeep. Joe got out to a quick lead with a couple big quests, with Gina and Kevin quickly following. I was picking up quests and trying to set myself up for a run, but I was looking for Wizards and the available supply was weak. Once I started getting them, I was quickly hit with a couple intrigue cards, severely hampering my ability to complete quests. By the last turn, there was not way I could catch up, and I was just hoping to complete one last quest when Louis hit me with a mandatory quest, adding insult to injury. Joe ended up running away with the game, helped by a Lord that provided a bonus for seven of his eight completed quests. Louis had pulled up close, but ended up in third behind Joe and Kevin. We spent all day Saturday painting our house with the help of our friends and family. It was a lot of fun, and things got done very quickly. 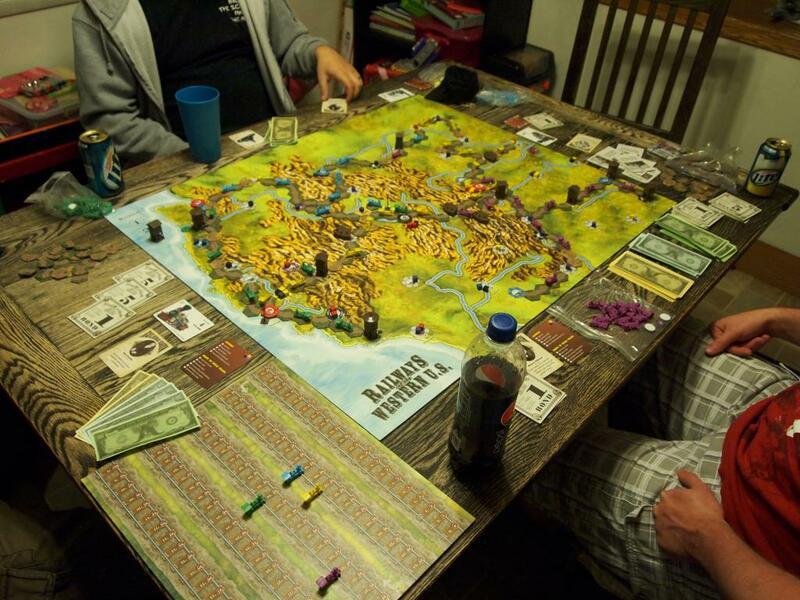 Following all that Gina called it a night early, while Joe, Kevin, Phil and I played games. We started out with Railways of the Western US. The game started with three service bounties and two hotels available, but even with only four people I did not take any of them. Hotel Denver wasn’t available by my turn, and the only Service Bounty was for Bismarck, which didn’t have an easy delivery. I ended up taking Government Land Grants and using them to build my tracks. I took control of the North Western area, but really wasn’t able to maximize the deliveries until too late in the game. Kevin spent a bunch of bonds, but started off quickly with service bounties and major lines in the lower right portion of the board, but the debt was too much. Phil was working around Denver early, but then took on the task of connecting San Francisco to Omaha. Joe Had control of the West coast, and though he started slower, he was able to get the train upgrades needed to really ship a lot up and down the coast. I managed to finish the game with only four debt, but I hadn’t been making many points so I still ended up in last place. Kevin was close to Joe, but the his debt did him in. Joe’s deliveries had carried him to the win. 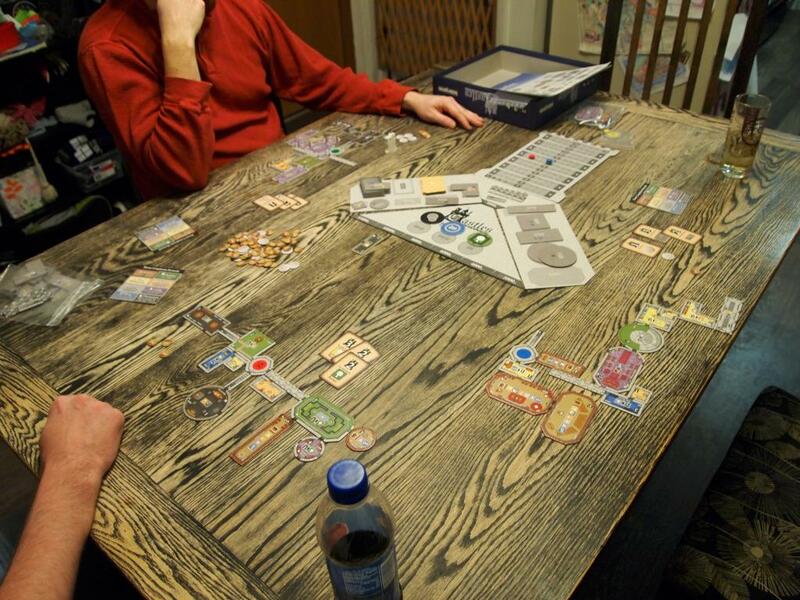 We then broke out Ginkopolis for a quick break. I managed to win with 60 points by focusing on the construction. 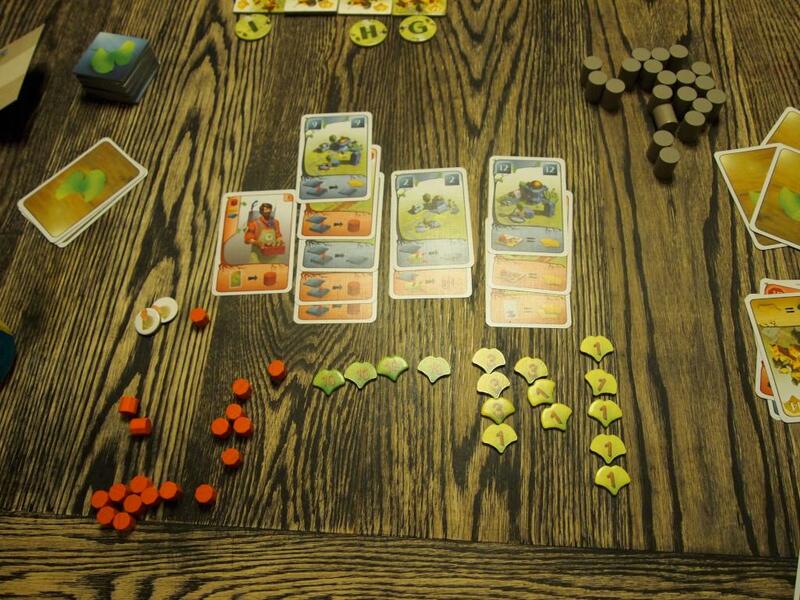 I had bonuses that propelled things and I was able to take control of two larger areas, much to Kevin’s chagrin. He was urbanizing a bunch and had a solid grip on a huge red area until Phil split it. We finished the evening with Dominant Species. I was playing as the reptiles, Kevin had the birds, Joe the arachnids and Phil was the insects. 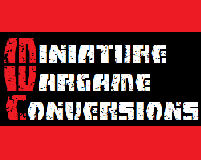 I was pushing for dominance through heavy adaptation, but about halfway through the game, Joe ended up with the same adaptations as I had, negating my dominance. Phil managed to take control of the tundra early, and scored a bunch of points before the rest of us realized what was happening. Kevin moved in to kick Phil out, but it was too little too late. Phil had spread all over by that point and was scoring a bunch of point in dominance as well. I did manage to score 45 points from dominance with nine tiles at the end, but it wasn’t enough to catch Phil. Kevin and I tied, and Joe brought up the rear. After a busy Saturday, Sunday was definitely a day of rest. 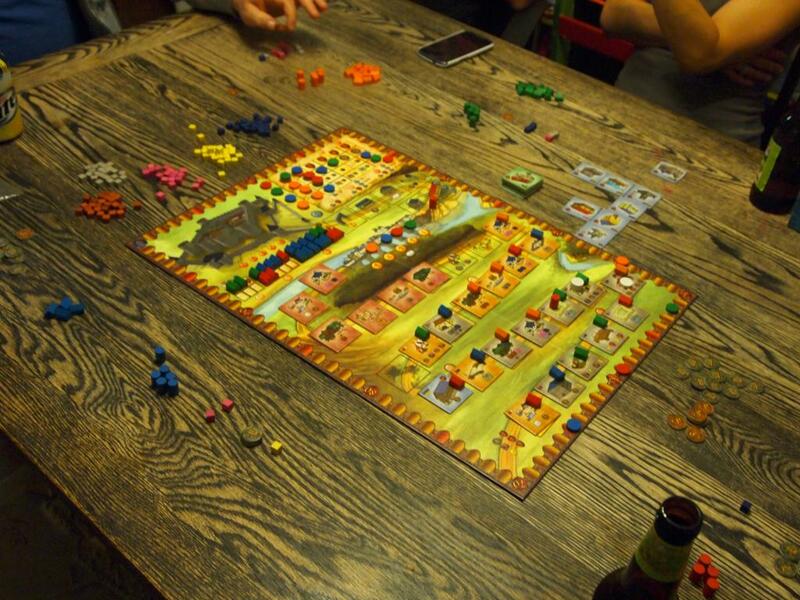 We did get together with Phil and Kevin, though and started the night with Caylus. I wanted to focus heavily on building, but Phil ended up doing the same thing. This resulted in a ton of building built early. The Lawyer wasn’t built until after the gold space, so there wasn’t any civilian builds for most of the game. Once I realized that the building strategy wasn’t going to work very well, I started just gathering as many resources as possible to assist in the building of the castle. Kevin and Gina had supplied a little, but no one was heavily focused. I was able to out supply Kevin on most turns and earned enough favor to help continue my supplies. Kevin did manage to build a prestige building for 16 points, but I had supplied enough to hold the lead. The game was accelerating quickly, since there were so many building past the Bailiff, the Provost was constantly out in front. Without that speed, I don’t think I would have been able to sustain the lead, and Kevin would likely have been able to catch up with buildings. The game did end quickly, and I held the lead by a few points. 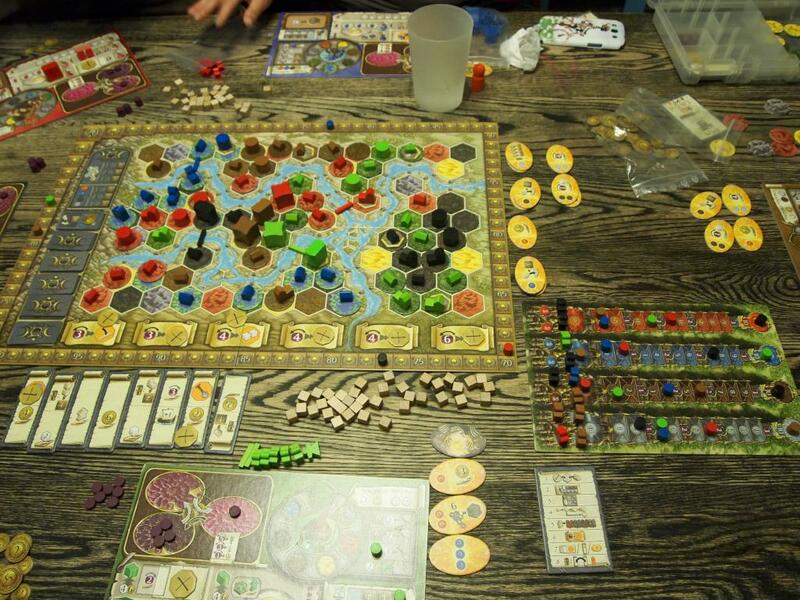 We finished the night with Terra Mystica. 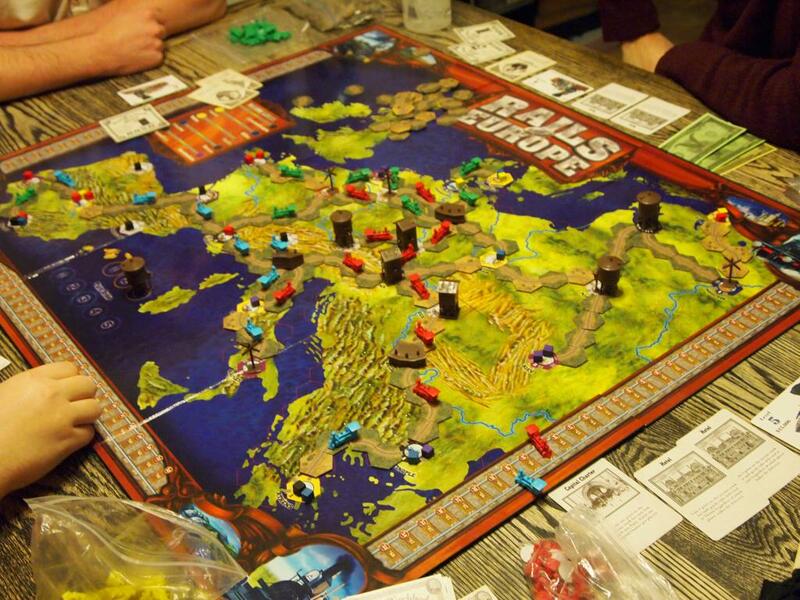 I was playing the Witches, Phil the Darklings, Joe the Giants, Gina the Morbanks, and Kevin the Halflings. Everyone started off crammed into the middle and a lot of us went for strongholds early for the first turn bonus. I was also able to pop out a couple dwellings and a bridge, costing me a large chunk of my power. After turn two, though, I wasn’t feeling good about the game, as Joe and Kevin had kind of blocked me in in the center, and Phil was getting in the way in the lower right. I didn’t think I was going to get much going at that point. I stayed the course, though. I built a Sanctuary on round three to get my first town and took the favor lowering the requirement for towns from 7 to 6. I was then able to easily build a town in the lower right on the following turn. That really changed everything. I had the income and had enough time left to build a third town in the upper right. I was also able to fully develop my shipping to connect my empire and tied Joe for first. At the end, I held one of the cult, and was in second in two others. Kevin had similar position and we were neck and neck all game. The points for my empire were the difference maker, and I ended up beating Kevin by three points. Everyone was in attendance Saturday night. 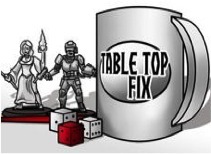 Phil, Ryan, Louis, Kevin, Laurel, and Joe all wanted to play, so I had to setup an additional table to fit everyone in. 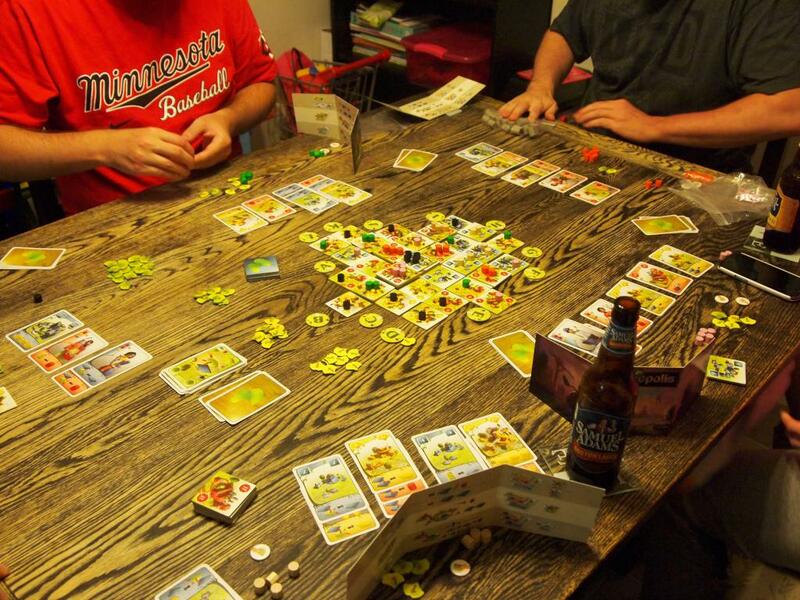 Louis, Phil, Kevin and I played Castles of Burgundy, while Ryan, Joe, Gina and Laurel learned Ginkgopolis. 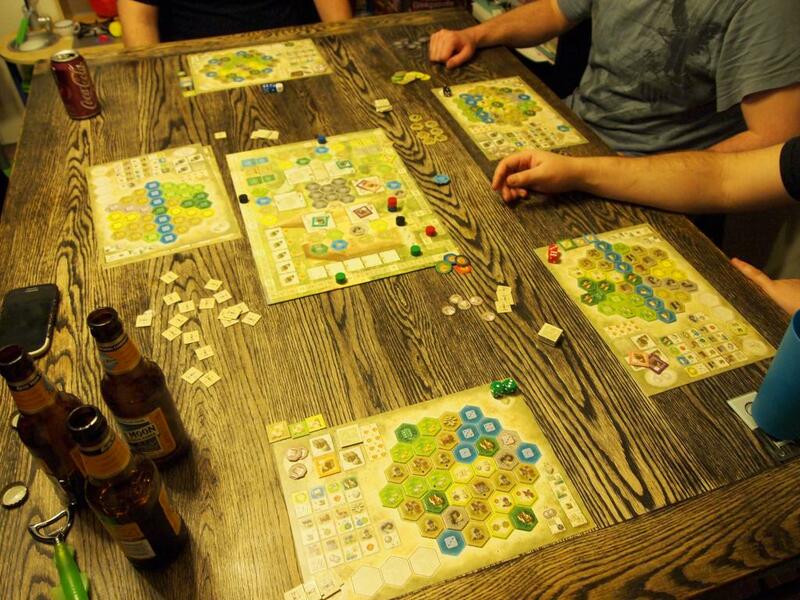 In Castles of Burgundy, I was ignoring boats and animals early. I was trying to fill in my cities and grab the bonus tiles for the buildings. I was mostly successful, netting a bunch of Watchtowers and Workhouses along with their bonuses. Phil and Kevin were both shipping a fair amount of goods, while Louis was filling in a lot of small areas in his estate, grabbing a bunch of bonus points early. In the end, I was able to fill in my animals, cities and knowledge areas, but the end game bonus wasn’t enough. Louis had built a huge lead with all of his bonuses during the game, and then added a fair bit more at the end. 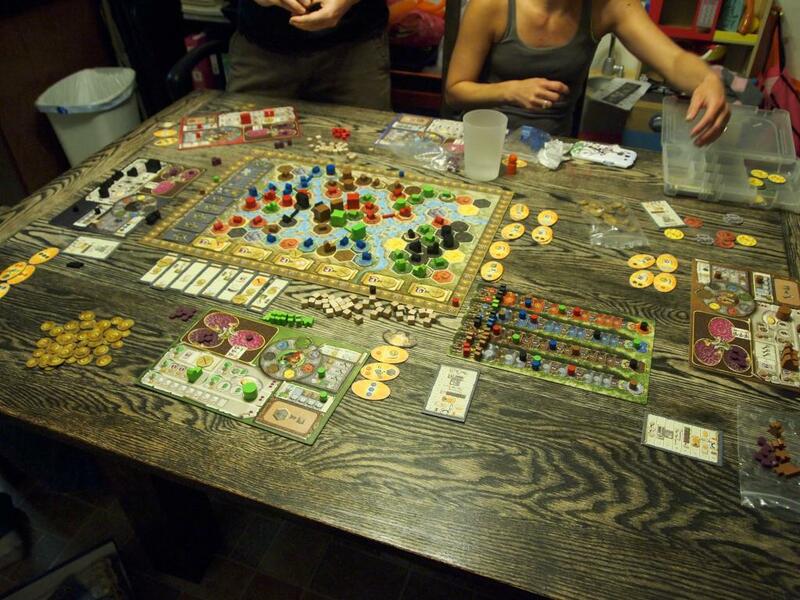 After we finished that and the others finished both Ginkgopolis and 7 Wonders, Ryan and Laurel had to take off. 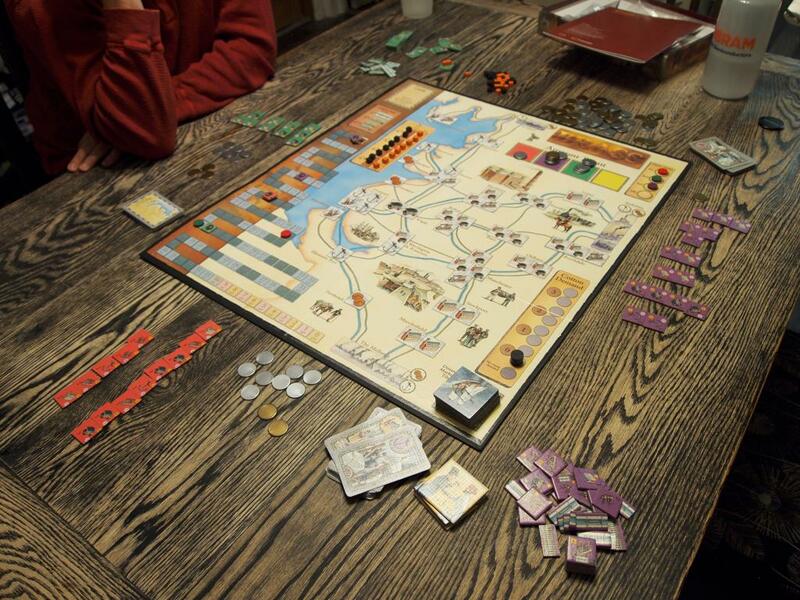 The rest of us sat down for a round of Railways of the Western U.S.
My baron was to have the most bonds, but that idea got shot down in the opening bid. Joe was bidding hard for the opportunity to go first and I didn’t want to hamstring myself that much. I ended up picking up Hotel Topeka with the intent to deliver a bunch of the purple cubes that were in the area. Gina was also down in that area, delivering to Oaklahoma City and eventually connecting to Grand Junction for the major line bonus. Joe had Texas to Denver handled pretty well, and Louis had the Tacoma to Ogden route completed. Phil and Kevin were both on the West coast, with Kevin working much more efficiently. Phil had taken a ton of bonds to get started, but he eventually started making some big deliveries. We were all shipping quite a bit, and a lot of towns were emptying out quickly. The game ended before a lot of us expected it to, and scores were tallied. Gina finished with the fewest bonds and had scored the Baron for that. That pushed her into first place, with just barely over 20 points. It was the shortest and lowest scoring game we’d ever seen. It was at this point, that someone noticed that there weren’t enough Empty Cities. Apparently I had miscounted and we only had 16 instead of 18. We called the game as it was, and another round would not have significantly affected the score most likely. After everyone left, Gina and I finished the night with a quick game of Ginkgopolis. I focused on spreading out with the urbanization action. I managed to get the building card that provided a bonus for each building that was size 2 or less. That netted me about 15 points at the end and provided the winning points. 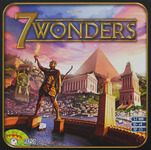 Ryan, Kevin, Louis, Joe and Dana joined us for games on Saturday and we decided to start off with 7 Wonders with everyone. I was doing alright up until the second age, when I passed on an Iron resource. Joe didn’t pick it up, and I didn’t see another iron for the rest of the game, really hampering my plays. Everyone was pretty even after Age 2, but then Dana grabbed a ton of science cards in the third age, helped with her wonder’s ability to play cards form the discard pile. She pulled ahead significantly and finished the game with the win. 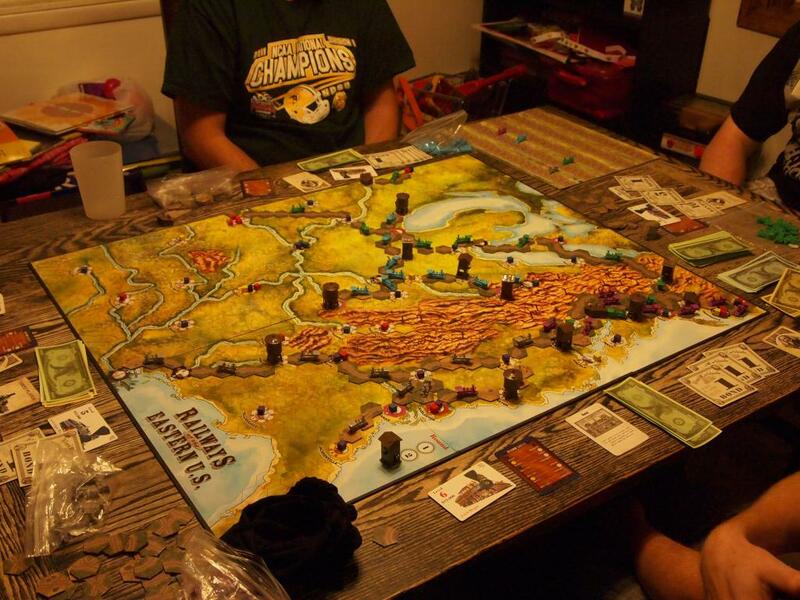 For the second game, Ryan sat out and we broke out Railways of the Western US. 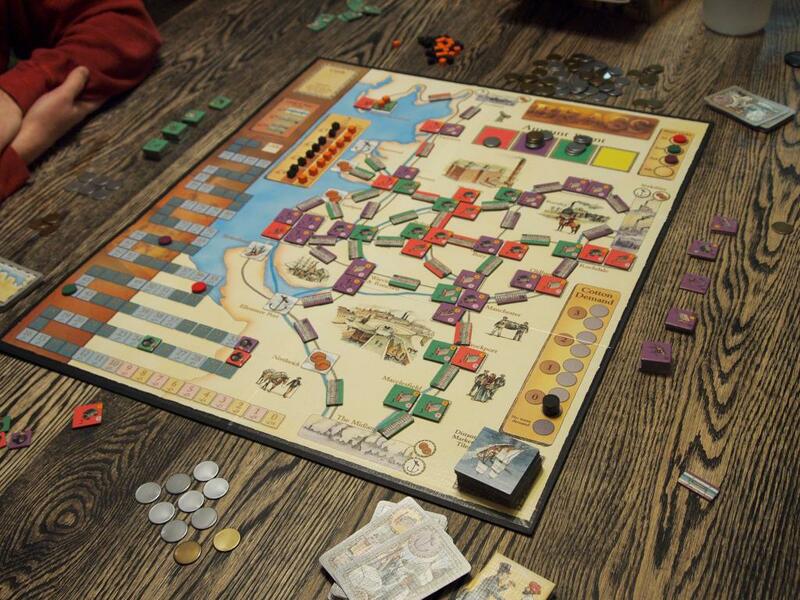 My baron was to connect and urbanize two cities in the Northwest, and I was able to do that fairly early, along with picking up the Passenger Lines bonus for shipping different colors. After that, though, things went downhill. Louis was getting a ton of use out of his Hotel: Denver, and at the same time he started working on the Golden Spike bonus of going from San Francisco to Omaha. My stuff was pretty disjointed, but I had opportunities to finish the major line from Portland to Ogden and San Francisco to Promontory. In each case, though, I was trying to do it with as little debt as possible. Joe and Louis were willing to spend the debt, and I ended up being a turn too late in both cases. On the last turn, I was finally able to connect Tacoma to LA for a major line, which bumped me up to fourth, but Kevin and Louis were still way out in front. Louis actually ended up winning by five points after completing the Golden Spike. The first time someone managed to do that without going crazily into debt. 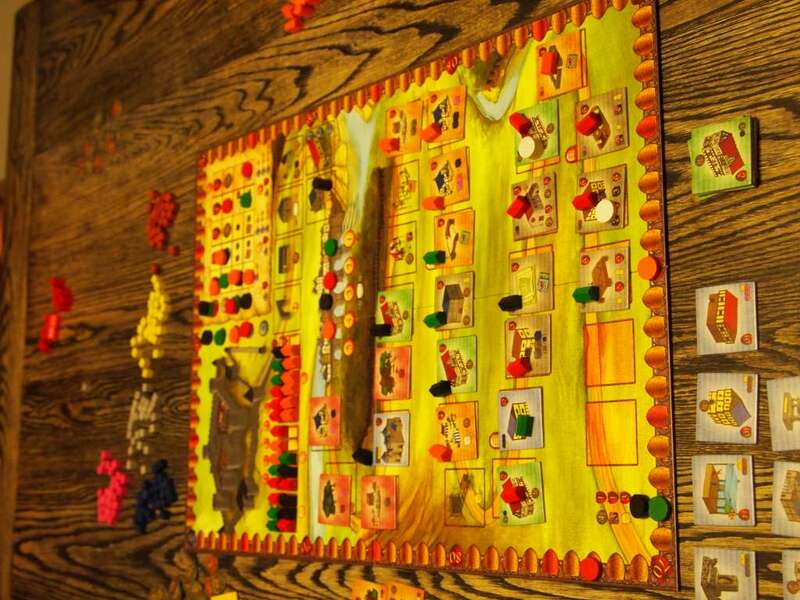 The night ended with Kevin, Louis, Joe and I playing Caylus. I was originally planning to gather goods and support the building of the castle. Louis very quickly built the three wooden production buildings and was gathering goods faster than I could. I was able to grab cloth a couple times and was the only person building civilian housing. I was able to use the extra cash and the inn to get a bunch of extra actions while the others were struggling to make due. I was third in turn order with three good production buildings, so I was getting last choice of those buildings. For some reason Stone was rarely being picked. I ended up stocking up on a bunch of stone, built the Stone Builder location and then the Build Monument tile. Joe had meanwhile built the Money-to-Gold tile, so I was able to use that to gather gold in anticipation of building the Cathedral for 25 points. The problem, though, was that Kevin was consistently alone in contributing to the Castle and then using the bottom favor track to build the high point stone buildings. By the time I was able to build my Cathedral, Kevin was already 30 points ahead of me. I had the goods to build another monument, but there wasn’t going to be another turn. I ended up tied with Joe, five points behind Kevin, with Louis only a couple points behind us. 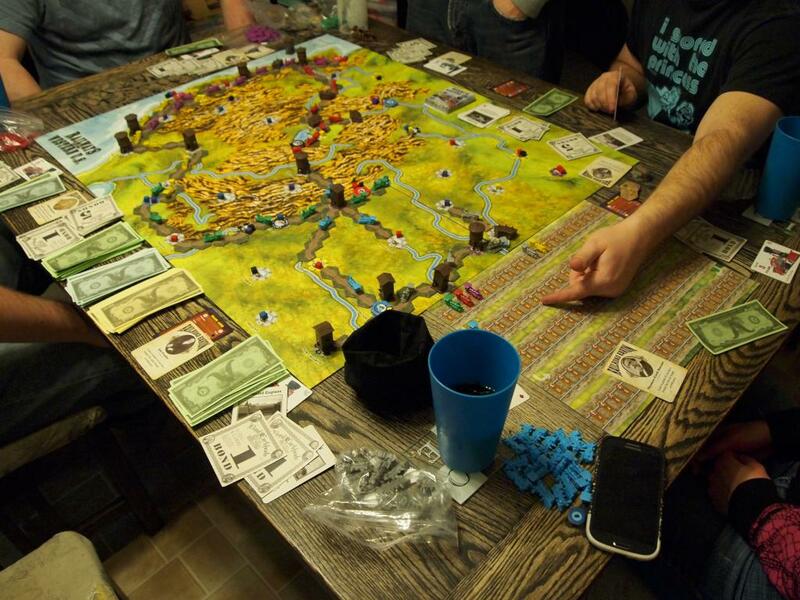 A good night of gaming, with some very close games. Until next time, happy gaming!